3 Large Anatomical Stretching Charts with 48 Different Stretches for the Upper Body, the Lower Body and the Neck, Back & Core. Each stretch comes with a detailed anatomical muscle drawing that shows you the exact muscles being stretched! Pictures in a book are fine, but not always easy to find when you’re in the middle of a workout… But with the Anatomical Stretching Charts hanging on your wall you’ll always have the perfect stretch right in front of you. You’ll be able to pick and choose the stretches that match your workout. Plus, you’ll have a constant reminder to make flexibility training a routine part of every workout. 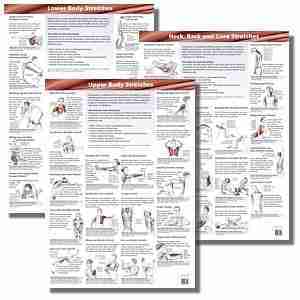 Each stretching exercise chart is a huge 2ft x 3ft (23.4 x 33.1 inches or 594mm x 841mm), full-color visual wall chart, printed on high quality 100# gloss art paper. “I purchased another vendor’s stretching chart before I bought your Anatomical Stretching Charts. The former chart had tiny print and pictures and no information. It was useless. Your charts are fantastic. They are easy to read. The print and illustrations are large enough to be seen without a magnifying glass. Well done!” Dorothy S.
“Very helpful and easy to use – identifies the individual muscle(s) each stretch focuses on. Great item to have.” Judy W.
“Very good product, accurate body positioning is well displayed in good proportional diagrams. Specific groups and muscles are clearly identified and labelled. Good coverage of all body parts. Nice quality poster material with easy to read lettering. I Recommend.” Bradley M.
“I purchased a set of these charts for myself a month or so ago. My sister was so taken with them that I bought another set for her. They arrived promptly and in perfect condition. They are informative and easy to read. She loves them. Thanks!” Eugenie S.
How will the Anatomical Stretching Charts help you? The charts will give you the tools you need to take your flexibility to the next level. 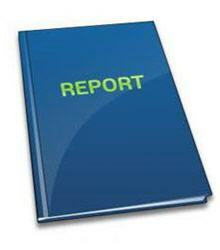 They’re designed in an easy-to-use, quick reference format, meaning you can access the information at a glance. Whether you want to alleviate annoying tight muscles or loosen those stiff joints these stretching exercise charts will help you. They will even help you improve your physical ability and sporting performance. Sick & tired of tight, sore muscles? – The Anatomical Stretching Charts will give you the stretches you need to loosen your muscles and reduce that pain. Suffering with stiff joints and muscles? – The Anatomical Stretching Charts will help you increase your flexibility and do away with stiff, tight muscles and joints. Sick of not being able to perform like you should? 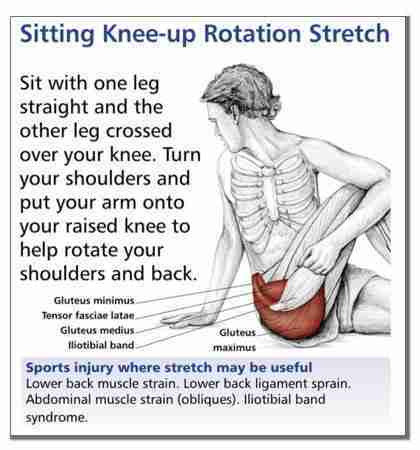 – The Anatomical Stretching Charts will help you improve your flexibility and your sporting performance. The Anatomical Stretching Charts will help you boost your performance, avoid injuries, alleviate muscle pain, maximize your workout, and maybe even extend your career. The Anatomical Charts come with all the information you need to confidently perform the stretches that will make all the difference to your flexibility. Plus, I guarantee you’ll receive your charts in pristine condition. The Anatomical Stretching Charts will arrive packed in a solid cardboard mailing tube to ensure delivery of your charts in A1 condition. These are a great teaching aid for massage and physical therapists, chiropractors, and all health care professionals. And because the Anatomical Charts are such a unique product, I know I could charge a lot more, but for a limited time you can get the set of 3 Anatomical Stretching Charts for…. The bottom line is… Your results are guaranteed. When you use any of my stretching and flexibility products you’ll get everything you need to improve your flexibility and fitness. 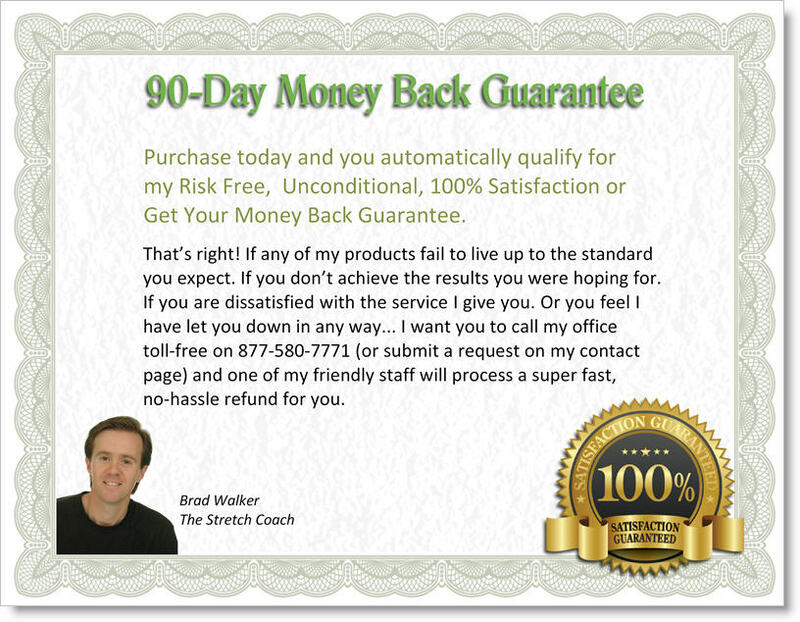 And with my rock-solid 100% Money Back Guarantee, you’ve got nothing to lose. So don’t delay; this offer expires soon. Get the Anatomical Charts and improve your flexibility now. P.P.S. Remember, if you order today you’ll get all the extra special bonuses that are the perfect companion to these stretching exercise charts. And you’ll also qualify for my risk free, 90-Day Money Back Guarantee. Don’t delay – Order now!